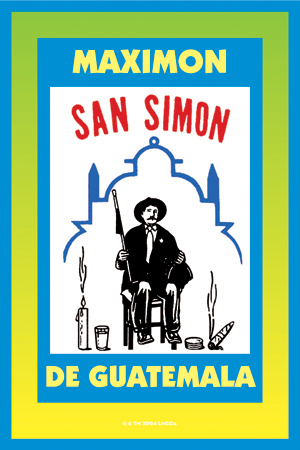 So, first off I was initially uncertain about where to post this question since it's relevant to the "Altar Tools, Religious Statues, Holy Cards" and the "Ask for Help" section but, that notwithstanding, I was wondering if anyone has had much experience with Maximón, also known as San Simon of Guatemala? My "sister" suggested that he might be useful in some of the current financial/work endeavors I'm trying to undertake. From the research I've done on the LM site as well as other articles I've come across, he doesn't necessarily seem to be too savory of a character insofar as "devotional style" work is concerned. Any thoughts on the matter? Maximon, is, as you know, the emanation of a pre-Columbian sky god. As such he is approachable, but some cultural understanding of the way these syncretic gods work is also adviseable. 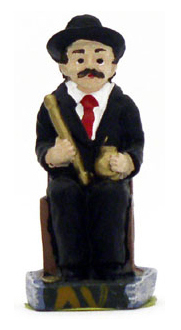 A little statue of Maximón will do; he likes tobacco, rum, black rice and beans, and offerings of Coca-Cola. You should pray 3 Hail Marys, an Our Father, and a Rosary before you do any work with him. Offer on his feast days frequently and make use of other days in the Christian calendar to work with him (the closer to Christmas, I've been told, the better). 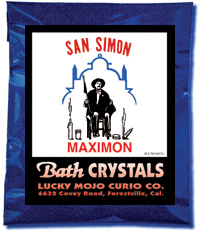 Charm Vial, Maximon contains herbs and seeds, 2"
Thank You, Maximon / San Simon! every since i have been working with San Simon (Maximon) he has been soooooo good to me!!!! i mean he really helps me out...especially in money matters. i luuuuuv him soooo much!!!! i even kiss the statue i have of him on my altar!!!! i recently petitioned him because i had sum tickets to pay and sum other things i had going on. i kid u not they gave me $900 dollars 4rm my daughters fathers income tax and my son's father paid his share of child support at the same time!!!! then i went to the casino with a lil change...like $70 and came out with $600. he truly is a good saint...but u have to give him his offer offerngs 1st!!! i always give him cigarettes, tortillas, whiskey, copal incense along with other incense and a candle depending on what im asking him for. Re: i cant get enuff of San Simon! 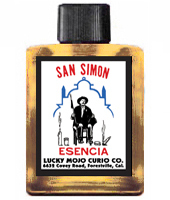 San Simon is a powerful ally to have on your side! So glad that he is coming through for you! Our own Momma Starr works extensively with him. YOu can find her on AIRR for anyone wanting more information. Re: Thank You, Maximon / San Simon! i absolutely luv momma starr. whenever i have her set lights for money for me, thats exactly who she works with! I would like to humbly and honorably thank San Simon for answering my petition for aid and working with me. I am honored and am so very appreciative. Thank you. San Simon, I would like to humbly thank you for working with me and teaching me! Thank you, Thank you and Thank you again. Would it be inappropriate to put a Maximon altar in one's bedroom? I live with family, and the only space of my own is in my bedroom. Many people have altars in bedrooms, since for many, the bedroom is the most private place. Go ahead and set it up there. THANK YOU SAN SIMON for your AMAZING assistance in helping us get the 2 month booking on the mansion. I thank you for helping me find and create this opportunity. I created an altar for San Simon on Friday and offered Rum, Coca-Cola, Tortilla and a Cigar. With Tues being his feast day tomorrow, is it wise to remove these current items from the altar and replace with new? Also, anything specific in prayer? The only thing I read prior was to tap a water glass 3 times to summon him and then 3 times to release once finished with petition? Please let me know best way to continue work with him on matters. I am so sorry that we missed this post. Obviously, it's too late to answer your questions for your Tuesday worship. I suggest, in the future, that when you have questions that have a "deadline date", that you ask at least 3-4 days in advance. This spell is good to get your target to come to you. At midnight, write the target's name on the cigar at the cone shaped end 7 times with the red pen. Then take the Cigar with both hands and roll it gently while dedicating the cigar to San Simon and asking the spirit of the tobacco to dominate the mind , body and spirit of your target. Flip the cigar towards you 7 times then gently rub the cigar from your feet to your head over your body with special attention to your genital area. Complete this by circling the Cigar over your head 7 times. Place some drops of oil in the foil( at this point you can add honey or sugar if the target is extremely stubborn) and the pins to the foil. Insert 3 pins at an angle around the tip of the cigar, then 3 pins in the middle. The last pin should be inserted in the middle of the 2 rows. So you should have 1 row of 3 pins then just 1 pin by itself then the last row of three pins. Insert a broken match into the end of the Cigar, light it and blow smoke onto the targets picture while issuing commands. Puff on the Cigar until the pins have dropped. 1 pin drop, target is trying to come to you. Thank you for this spell. I have moved your post to another thread since you are working with St Simon. There are St Simon products suggestions on this thread that may enhance your spell. Is Maximon's day Tuesday or Wednesday? I'm getting conflicting information. I set up my Maximon altar on Tuesday. Today I asked him for a sign that he was pleased with my offerings and would choose to work with me. I left the television in that room on a music station while I worked elsewhere in the house. Periodically, I returned to the room to get something. I would glance at the screen to see what was playing, and not once but twice, it was an artist named Maximan. Thanks, Miss Aida! I'm excited. Thank you san simon for being in my life and my home. Your are a wonderful man. I started off work with San Simon. it's been a great experience. San Simon is a very hot spirit. I felt so hot, the room was stuffy and suffocating. I couldn't even stand his presence. I had to bring Saint Cyprian on another altar to balance and direct the energy of San Simon. I came in minutes later, and it seemed there was a bit of struggle. the drinks on San Simon's altar snd lights, incense had all toppled. 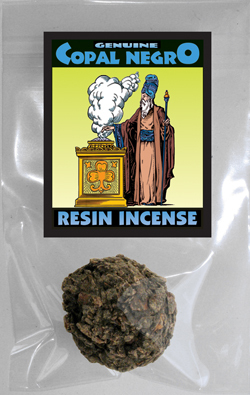 Even Saint Cyprian' drink on his altar was close to falling over. San Simon is so powerful. he has reduced my enemies to nothing in just few days. He is fast. San Simon, My brother, thank you so much. I love you. Keep working wonders for me. Is there a certain way to setup things on the San Simon altar? How do I petition him? I got an idea of the type of offerings but how do I place them? What color candle's are needed? If I use his statue where do I put my offering and candles? You would set up the altar the way that your heart tells you to.